Built ca. 1897 (?) as a hotel ballroom by Ferdinand Fellner & Hermann Helmer. 1951 hotel renamed "Grandhotel Moskva", 1989 re-renamed "Grandhotel Pupp". Used for classical and jazz concerts, congresses, conferences, balls and various other events. 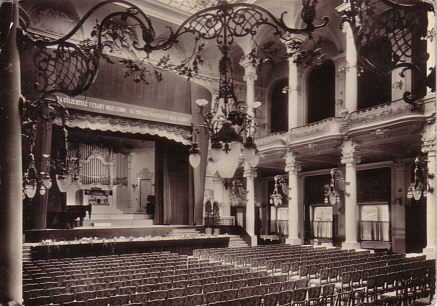 Reverse Text: "Karlovy Vary, Cedok Grandhotel Moskva, slavnosní sál - Karlovy Vary (Carlsbad), Cedo Grandhotel Moskva, banquet hall - Karlovy Vary, Cedok Grand Hôtel Moskva, La salle des banquets - Karlovy Vary (Karlsbad), Cedok Grandhotel Moskva, Festsaal"